The project itself is meant to be extensible, so that if it seems useful to you, you can contribute an implementation of the BudgetAdapter in order to have it work with your own budget format. I've been training for the Brussels Half Marathon this year! It's been fun so far, and it's my first race of any length so wish me luck. Anyway, during training you're always looking for interesting routes to run. This one is cool because it starts in Wallonia, passes through Flanders, and then ends up in Brussels, in the Bois de la Cambre, already one of our favorite places to run. Terrain: Mostly forrest with some farmland type areas. Passes by the Chateau de la Hulpe, which is a very nice bonus. Gentle hills up and down. Well, I've done it. It took me two serious days of wading through the mess that is the gdata APIs (myths and outdated versions abound) and the OAuth2 APIs (same caveats apply) and I was finally able to read the list of my own personal spreadsheets in Google Docs, and print their names out from an Android application. It was very important to me to be able to use Android's own build-in account mechanism, which took a fair bit of time to figure out, and then on top of that the build/class-path requirements for the Google Spreadsheets API is completely messed up. But anyway, here's a short description of how I did it, notes, and the full code for the main activity. 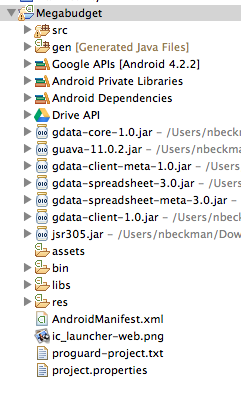 1 - I am using a Nexus 4, so I set up my app to use the latest APIs possible (Android 4.2.2 on my system). 4 - And finally, here is the code itself to run the main activity. The basic application structure was just the one that is created by default when you create a new Android Application. The basic steps for listing the Spreadsheets I got from the Spreadsheets API Tutorial. I can't really remember where I learned the OAuth2.0 steps, but needless to say, I cobbled it together from several online sources.